A fresh Nissan GT-R eh? I guess you’re going to give us the detail on every last hundredth of a second of 0-100 and Nurburgring split times? Er, no actually. This is a significantly different GT-R, but Nissan isn’t saying anything about the numbers. No timed Nurburgring lap has been run, they say. Like, oh yeah. And they won’t quote a 0-100kmh because, the story goes, a numbers war would contravene a Japanese manufacturers’ gentlemen’s agreement. So they restrict themselves to re-quoting the acceleration number from the old one – a frankly violent 2.8sec run from 0-100. Are they hiding a lack of improvement? A lack of significant improvement in the numbers, maybe. But it’s a significantly improved car. But a million internet flame-wars always hinged on GT-R’s bald numbers. What will the trolls do now? Moving on then. What’s the GT-R’s new direction? The old brute’s getting more civilised. The cabin is plusher, and noticeably quieter. The ride is less harsh too. The old dash consisted of instruments, screen, controls and vents all apparently taped together at any old angle by a five-year-old. The new one smooths it all off and integrates it. And in many versions it’s wrapped in stitched leather. The screen system has far fewer buttons, and it’s clearer. 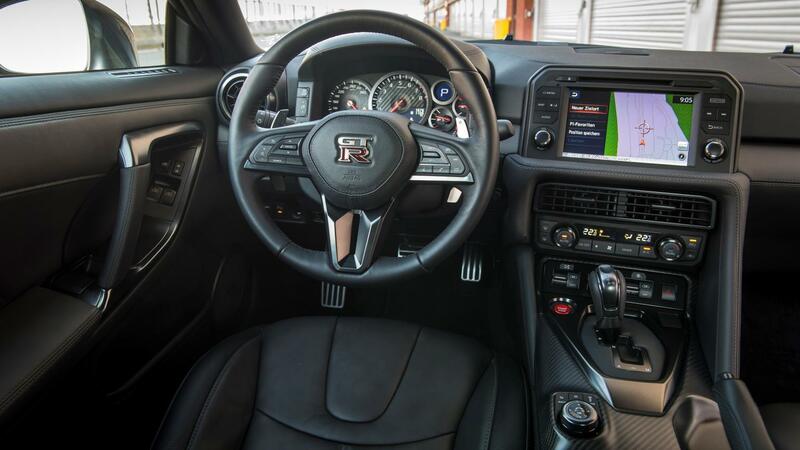 But don’t worry, you can still call up that captivatingly dweebish screen of power, brake, torque distribution and a zillion other real-time measures of the car’s internal organs. The engine is still a bit of a dreary hum, but a new active noise cancellation system takes away the booms when you’re cruising. Road noise is cut too, which is good because that was a big drawback before. And the ride, though it’s still stiff, isn’t so wearisomely harsh. Unusually for a mid-life refresh, team GT-R has updated the bodyshell itself for improved resonance damping. This means the suspension’s adaptive dampers can better get on with their job. Finally, the transmission is very much more housetrained. 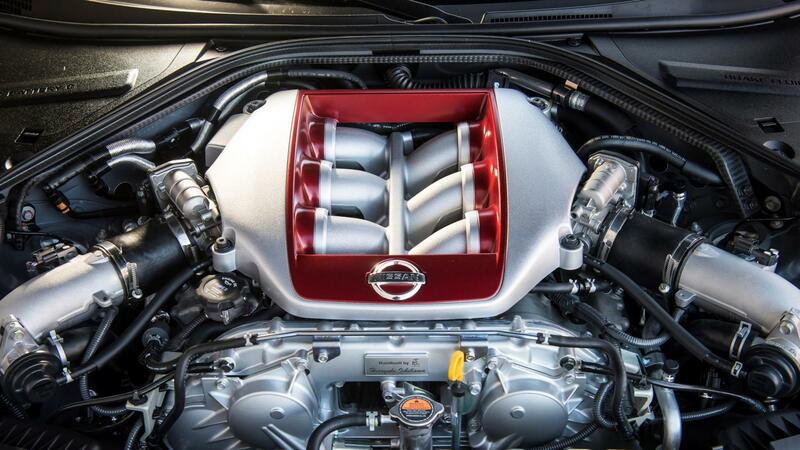 Anyone who’s been in a previous GT-R can’t have failed to notice the gear whine and low-speed snatchiness. No longer. So they neglected how it drives? Not exactly. Longtime chief of everything GT-R, Hiroshi Tamura, tells me the GT-R is no longer a “dot chaser”. He means it’s not just about hitting peak dots on a graph – max power, max g, whatever. “It’s more three-dimensional, because humans are 3D.” So the engine responds a little more sharply. The slightly softer damping (in the soft setting) makes it feel more natural. “It’s not only for the pub-talk player.” Or, he might have said, the web-forum spod. Doesn’t sound much different, all the same. Nope, it isn’t. The engine has a titanium exhaust system, for instance. It also has the ignition system from the Nismo – each individual cylinder is separately timed according to an array of parameters. But despite all that it makes only marginally more power: 562bhp versus 542. But think about Tamura’s “3D” reasoning. It’s alerter at all revs, and delivers an even more breathtaking rush though the uppermost decile of the revs. Which means it’s still astounding, a force of nature. Get the rev dial half-way round its travel, and you’re good to go. The thing just head-butts the horizon. Not quite like the similarly powerful McLaren 570, mind, because it’s hauling nearly a third of a tonne more. 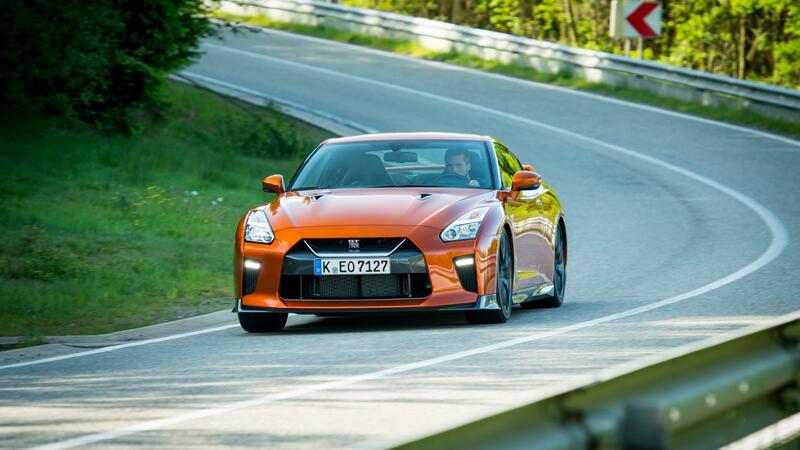 But there are times when the GT-R easily leaves a 2WD supercar behind. First, from a standing start, and second out of a slowish corner, especially a slippery one, because of the immense traction. Ah yes corners. It has a reputation for those. Quite. There are times when you feel the weight: try and change direction too fast and it’ll understeer. If a mid-corner bump or racetrack kerb sends it bouncing upward, it takes a while to come back down. The body definitely moves around. On the road the brakes are all you’d want. If you’re at a track with long straights and steep downhills, they’re only just enough to haul down this heavy car from the big speeds it sends you to. We were at the majestic Spa. Turn in at somewhere beyond road speed, and if the nose runs wide you can lift and it tucks in nicely. Then you get ridiculous grip, and the chance to make a wake-up call on the vast thrust. Get on the throttle super-early and the tail twitches, but if it’s dry the 4WD will shuffle torque forward to resolve things. It keeps torque away from the front unless it has to, so the wheels can concentrate on steering. It is. On a racetrack, immense forces are easy pickings, and it’s quite a thing to feel the car working its complex magic for you. But it’s a road car. If it’s so very grippy and capable, does it have anything to say to you at speeds that are beneath it? Surprisingly, yes. The same messages, in attenuated form, are still there. The steering talks. The slightly more forgiving damping gives you a sense of the work each tyre is doing, of the weight and the torque shifting around. And of course brief bursts of the throttle always make a deep impression. It looks different outside too. Just a cosmetic facelift? It’s all very functional. The slight power bump calls for more cooling, so the main front nostril is bigger. To avoid this increasing the drag, they took compensating measures. Those include a new bonnet to better channel air over the car. Also, if you peer at the C-pillars for long enough you’ll see they’re very slightly remodelled, to reduce turbulence. Again, amazing that Nissan made a small but costly change like that. Now of course, with drag pared back, there was the danger of lost downforce. To counter that, you see little integrated canards at the lower-front corners, and re-shaped sills to inhibit air from worming its way under the car from the sides. So overall, even the aero numbers – lift and drag – don’t change. Where’s the progress? Good question. 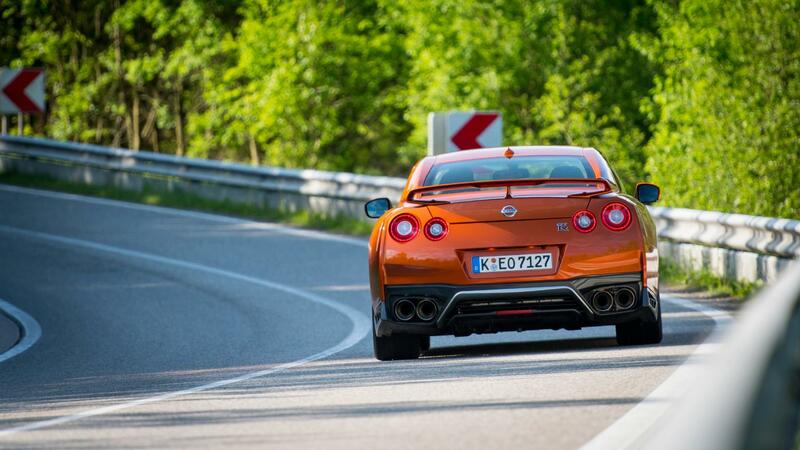 This round of mods has made the GT-R more civilised, rather than a better sports car. But Nissan has a trick up its sleeve, in the form of a ‘Track edition by Nismo’. It’s £89,995 and has a stiffer shell again, uprated suspension and wider, lighter wheels. As soon as Nissan has one of them to try, we’ll be grabbing the keys. As for the ‘basic’ GT-R, there are now some very good sports cars around for not a whole lot more than the £79,995-£83,495 that Nissan asks. Yes it’s still a conspicuous bargain, and an eye-widening performance device. But it’s not the manic outlier it once was.